Making a presentation in PowerPoint is all about design, and as goes anything related to design, you scrape a lot of ideas and replace them with something more fitting. With that said, the Undo function is probably one of your best friends while using PowerPoint. Without Undo, how would you test out new looks but be able to quickly switch back to the original if something goes haywire or ends up looking horrendous? Let’s increase how many times we can hit the undo button! 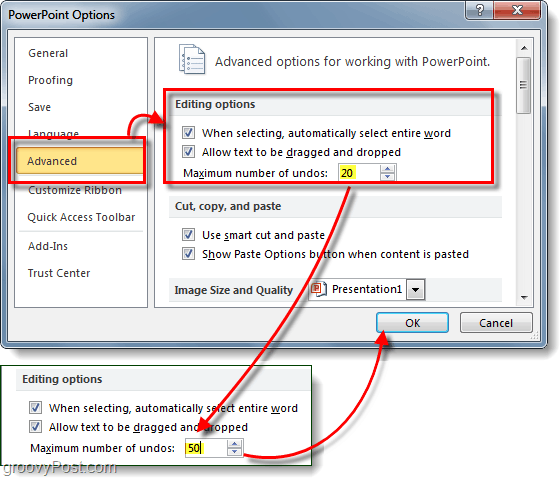 In PowerPoint 2010, Click the File ribbon and then Click Options. Click the Advanced tab and then Change the Maximum number of undos box to a higher number like. In the example below I set it to 50. Click OK to save changes and exit. Now you can make up to 50 mistakes in a row while using PowerPoint! Hopefully you won’t ever need to undo that much! This can be the most useful if you ever need to revert back to an older version and you haven’t backed up previous revisions by reading this groovy how-to tip using dropbox for backup office temp files.